Our CEO, Dr. Greg Jacobson, has a cartoon hanging in his office. It must be pretty popular, because I found out Mark Graban actually referenced it a few years ago in this post. The cartoon depicts a medieval king preparing to fight a battle with swords and shields - and a guy selling machine guns. The king is so focused on his next task, he is ignoring the salesman trying to sell him modern weapons, which would easily carry his army to victory if he took a moment to think about it. This cartoon is funny because of the parallel between this situation, and one that we often come up against in sales. People are often so busy fighting fires that they’re unable to take a step back and find a solution for the root cause of those fires. I liken spreadsheets and Sharepoint to the swords and shields in the cartoon. It might be obvious that modern weaponry would provide a great advantage in a medieval battle; it's not always so clear to lean consultants that software can provide a huge value-add to the way they serve their clients. Rudimentary tools such as these have been effective before, and most people are familiar with their uses and limitations. But now it’s time to retire them in favor of something more effective. Just as the king has access to better tools, so, too, do continuous improvement programs have access to better tools for managing improvement work. Retiring Excel and Sharepoint in favor of continuous improvement software offers some key advantages: it saves the time spent building and maintaining the tool, allows consultants to focus on improvement work, and is optimized for the job. One of the challenges I often hear from consultants is that when an engagement has finished, they come back later and find that people have reverted back to their old ways, and the engagement failed to result in long-lasting change. This is due in large part to the fact that the consultants typically have to be on site in order to see how the culture they’ve introduced is sustaining. Their spreadsheets record improvement, but they fail to give insight into the bigger picture from afar. 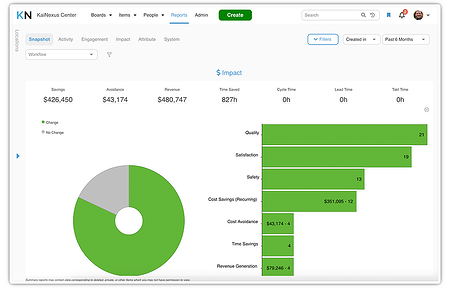 Continuous improvement software has specialized reports that track engagement rates, location-based activity, and the status of improvements. Consultants use these real-time reports to periodically assess the health of the improvement culture, both remotely mid-engagement and periodically once the engagement has ended. In this way, they’re able to see how the culture is sustaining - and step in to provide coaching when things are getting off track. Another problem consultants have relayed to me is that, although you can often see the change in attitudes and work at an organization, it is difficult to quantify the extent and impact of those changes. Executives typically want impact metrics to justify the investment they’ve made in bringing on outside consultants - and soft data like attitude adjustments simply doesn’t cut it. Spreadsheets need complicated and time-consuming formulas and workflows to aggregate improvement effort. Replacing these with continuous improvement software provides a high-level overview of financial impact while allowing anyone to take a deep dive into specific improvements or projects. This level of detail makes it possible for you to show executives the precise impact of your work, thus justifying their investment in you. Many organizations take their data out of spreadsheets and onto visual boards in order to make the information more accessible and digestible. These boards too, though, are notoriously difficult to maintain and assess. Continuous improvement software takes the information you format, print, and hang on boards and makes it digital. You can still customize what’s on the board and how it looks, but the information is displayed on a monitor or projector screen instead of paper. Benefits to making boards digital are numerous for both the organization and the consultant. Staff saves time updating the boards, they can drill down into the details of the cards on the monitor rather than having to schedule meetings to get answers, and the data you log in the software is displayed on any chart, anywhere in the organization, and updates in real time. From the perspective of the consultant, digital boards are invaluable to your ability to monitor clients in real-time from remote sites. You can see what people are working on, where progress has stalled, and where bottlenecks occur from your own computer, rather than having to make extra site visits or rely on photographs of bulletin boards from your clients. In this way, you can hone in on problem areas across the organization all at once. When a consultant comes to an organization to help grow a culture of continuous improvement, engaging front line staff is always one of the primary goals. This is another area where spreadsheets fail. Because they are stagnant and inactive, information is filled in the boxes and then often promptly forgotten. Continuous improvement software utilizes customizable Active Notifications to increase engagement rates by sending emails to let people know when they have been assigned work, when there’s an update they need to know about, and when due dates are approaching. For consultants, this eliminates part of the difficulty of increasing engagement because the software automatically reminds them of work that needs to be done. Additionally, these notifications are completely customizable. Consultants can set notifications to let them know when improvements are not assigned or are overdue, giving them opportunities to focus their coaching or re-engage with clients after their previous engagement has ended. Outside of increasing quality, one of the biggest benefits of an improvement program is the ability to share the knowledge with everyone. But as many consultants know, it isn’t easy to search spreadsheets or restricted Sharepoint drives for ideas. Using a software platform makes the best ideas accessible to anyone in the organization and it makes it easy for consultants to find the ideas with the biggest impacts to showcase to managers and executives. Doing continuous improvement means to never stop trying to improve. Spreadsheets may have been the correct tool for the job 15 years ago, but why willingly choose less effective methods when more modern and efficient ones exist. We want to make you a better consultant and we want to help you spread continuous improvement. Don’t be like the king in the cartoon. Contact KaiNexus today to find out how we can improve the way you help others improve.